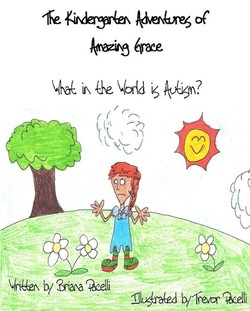 The Kindergarten Adventures of Amazing Grace - What in the World is Autism? Grace has all kinds of adventures in kindergarten. She loves learning about instruments, playing on the monkey bars, and reading books. Noah is in her kindergarten class, and Grace wonders why he sometimes acts differently from the other kids. She learns all about autism, making friends, and the importance of acceptance. This book was written by Trevor's sister, Briana Pacelli, and was illustrated by Trevor when he was 15 years old. It is being used by several school districts to help teach children about autism acceptance. From an Amazon.com reviewer: "I feel the book is an excellent story for young children. It clearly explains some of the social behaviors associated with autism. Miss Pacelli has captured the heart of readers with her book. I would highly recommend her book to families with young children."